Hey…hey, no, don’t cry. (You’re so ugly when you cry.) Ten seasons is still a lot for a show that struggled to find an audience out of the gate, and which has shown a zealous determination to blow up its own premise every time Reed and company get bored with what they’re doing. 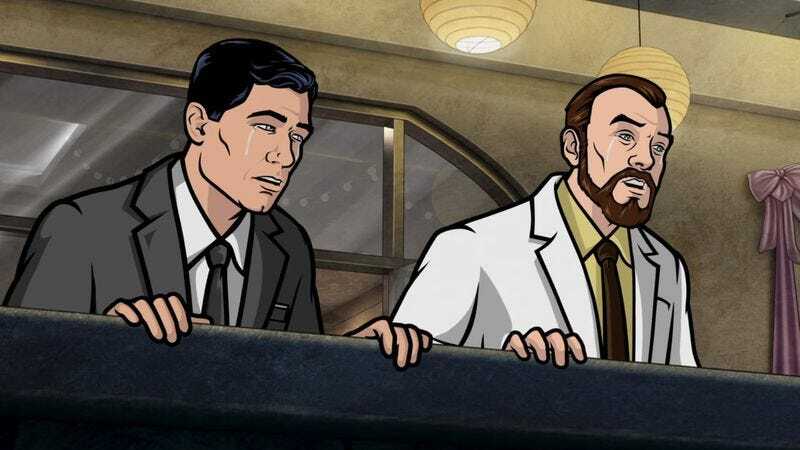 (A tendency most recently reflected by a seventh season-move to L.A.) Instead of mourning Archer—which will still be on the air through 2019, presumably—let’s just dive right into the danger zone, and baselessly speculate about what kind of high-concept season ideas Reed might have exploding around in his head right now. Archer In Space? (It’s been done.) Archer Underwater? (Ditto.) Archer On The Farm? Robo-Archer? (Given how the last season ended, that one doesn’t seem out of the realm of possibility, actually.) Quantum Archer, where Sterling bounces through history, entering people’s bodies and making them do stuff? Aw, “phrasing.” We’ll miss you most of all.